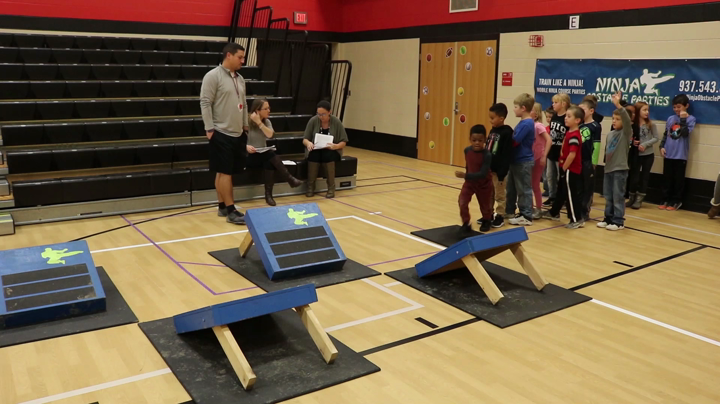 December 3rd, 2018 – Charles Huber Elementary students got to be ninja warriors for a day. The school had their PBIS Ninja Warrior Reward for students with positive behavior during the first semester. PBIS, or Positive Behavior Interventions & Supports, is a proactive approach to establishing behavioral support and social culture needed for students to achieve social, emotional and academic success. Three students from each classroom were selected to participate based on three criteria: most improved student, student with excellent behavior, and being a PBIS leader by encouraging their class. Students and staff participated by trying to complete an obstacle course similar to the ones seen on popular TV show American Ninja Warrior. “I had them run through the basic Ninja Course,” said Dan Arnold, owner of Ninja Obstacle Parties, who provided the obstacle course. Arnold competed on American Ninja Warrior in 2017 and made it to the finals in Cleveland. “We’ve got the quintuple steps, we’ve got two different trusses (hanging obstacles from an overhead bar), a bunch of different balance beams, and of course we’ve got the Warped Wall at the very end to finish up the course,” said Arnold. Students and staff had a blast trying to complete the Ninja Course.